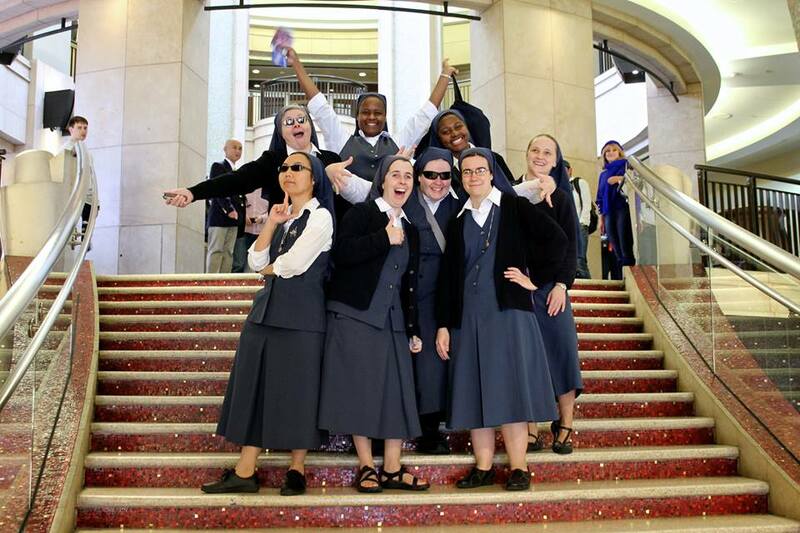 From December 28th, 2014 to January 6th, 2015, seven Daughters of St. Paul junior professed sisters from different parts of the country and one from Toronto, Canada, gathered in Culver City, right outside Los Angeles, CA, for a yearly Junior Encounter. The sisters, alongside Sr. Donna, Director of Formation for junior professed Sisters came together for a time of learning and sharing. This year’s theme was “Media Literacy.” The program included talks by other Daughters of St. Paul sisters, Hollywood actors and producers, movie critiques, a tour of NBC News studio as well as time for sightseeing around Hollywood. The 7 Junior Professed Sisters with Sr. Donna, Director of Formation for Junior Professed Sisters. 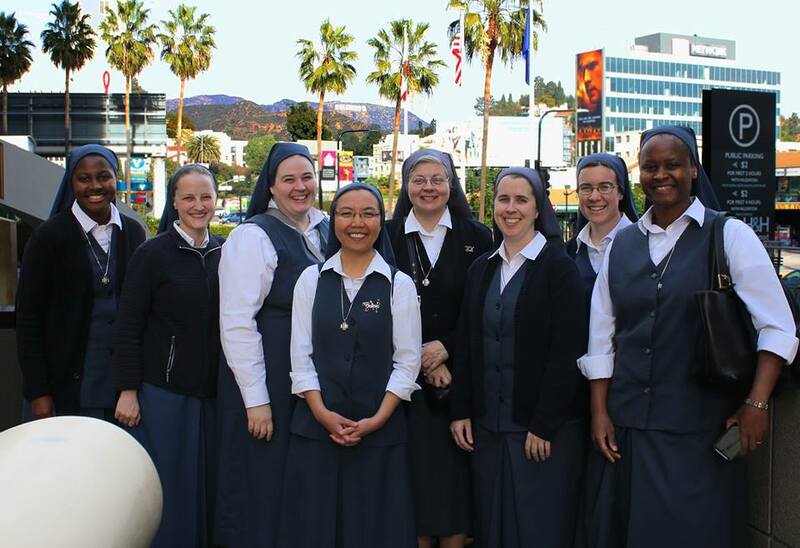 Junior Professed Sisters and Sr. Donna exploring Hollywood. Meeting Michael Harney, who plays Sam Healy, a prisoner counselor in the television series Orange Is the New Black, seems to have been one of the highlights of this year’s Junior Encounter. The actor shared with the sisters his personal experience of living out his vocation in Hollywood, how he balances his work, faith and family and what it is like to have people believe they know you because they see you on TV. Through his sharing, the sisters believe it became quite concrete why it is so important for them to pray for those who create media and participate in it. 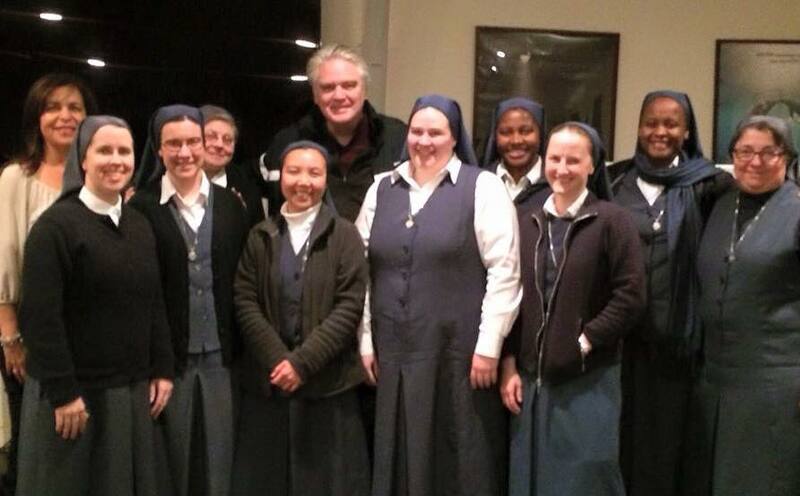 Junior Professed Sisters with actor Michael Harney from the cast of TV show “Orange Is The New Black”. 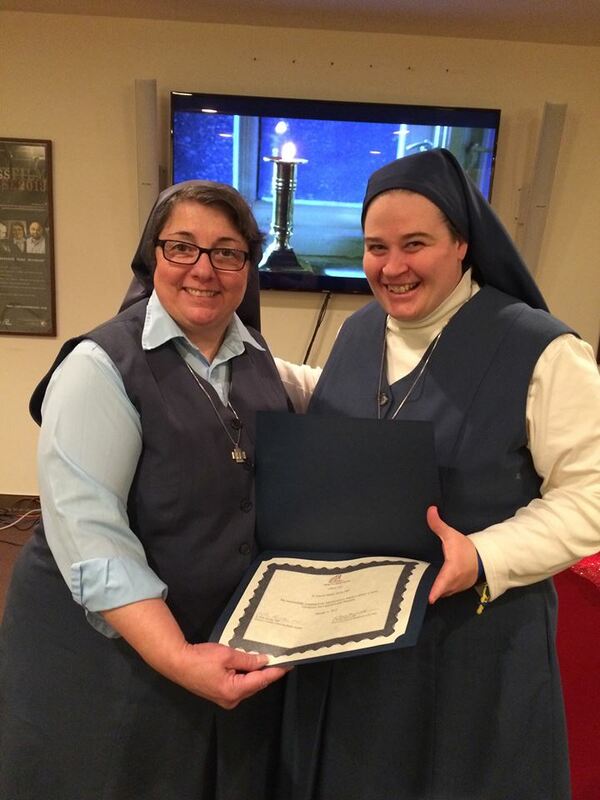 Sister Andrew Marie (stationed in Boston, MA) holding her diploma. Sr. Andrew Marie really enjoyed the encounter and one of her favorite parts of it was a tour at the NBC News studio. She recalls the tour guide telling them that he feels as though it is almost like a service to the world to put out good news, which she feels is an enlightening perspective. Sr. Andrew stated that this encounter is important to the sisters as Daughters of St. Paul and members of the Pauline Family as it helps them become better consumers of the media while teaching them how to guide others to make good choices with media and their faith. Nevertheless, she also really enjoyed spending sometime in the sun since where she is stationed, Boston, is in the midst of a cold winter. 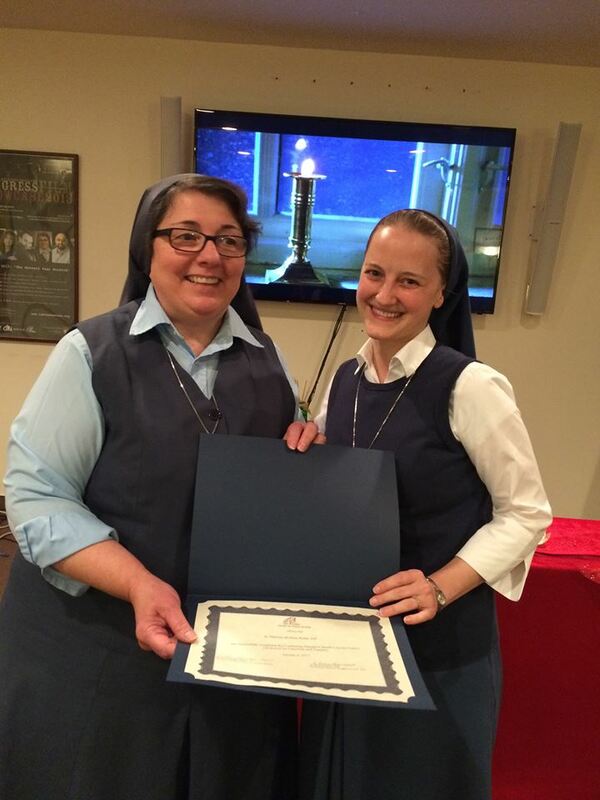 Sister Emily Beata Marsh (stationed in Alexandria, VA) holding her diploma. 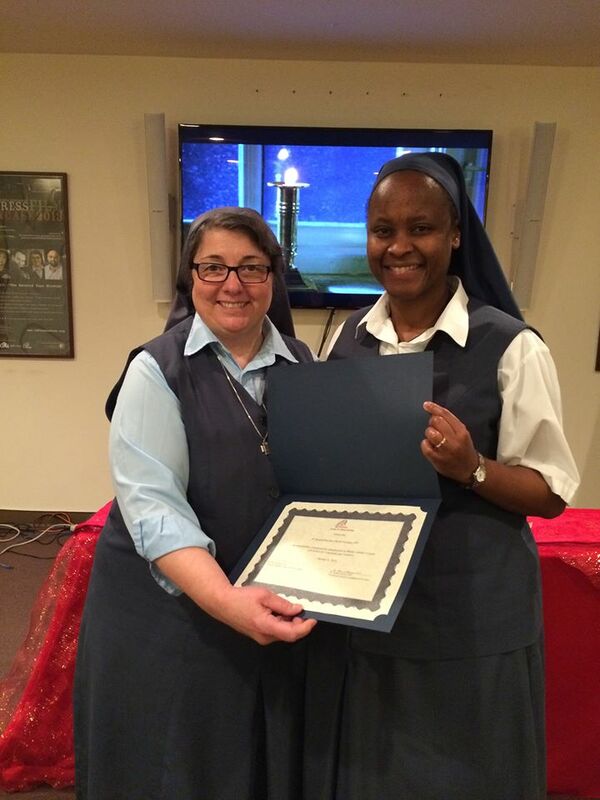 Sister Jackie Jean-Marie Gitonga (stationed in New Orleans, LA) holding her diploma. In addition to the enriching knowledge gained through the classes and time of sharing among the sisters, Sr. Jackie also enjoyed gathering with the Sister Disciples of the Divine Master in L.A. to see how they are living their charism in the liturgical apostolate. Her favorite thing was the insight shared by the actor Michael Harney, who shared his personal experience in balancing his work, faith and family. Sr. Jackie also found it very enriching to meet people in the Arts field and learn how they are using their gifts. 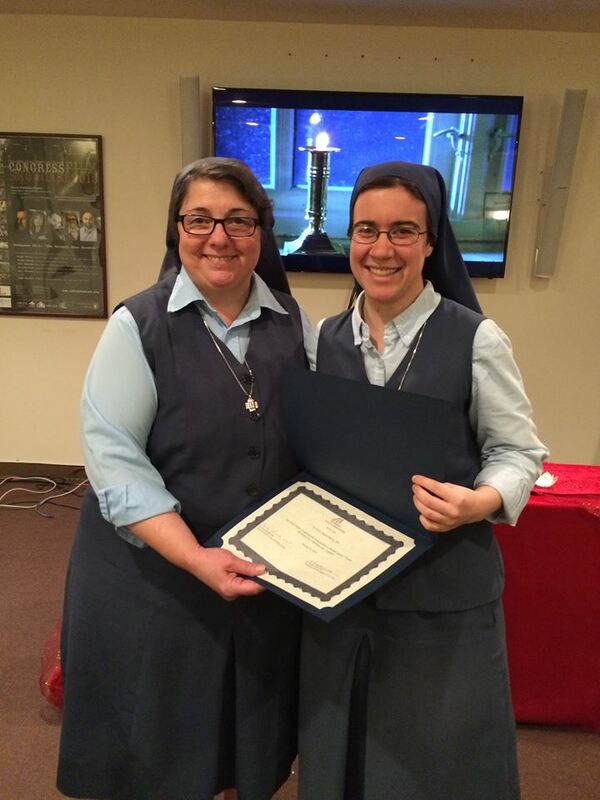 Sister Laura Fidelis (stationed in Alexandria, VA) holding her diploma. Her first time taking a media literacy class, Sr. Laura really enjoyed and found very helpful seeing media through the eyes of actors and producers. Her favorite part of the encounter was talking to Michael Harney and the NBC News studio tour. She was amazed by the technology found in the studio, and excited to learn how to make a newscast happen. She learned that part of the production department in a newscast is coded; in other word, there is no cameras moving or zooming in and out, it is ALL controlled by a computer! 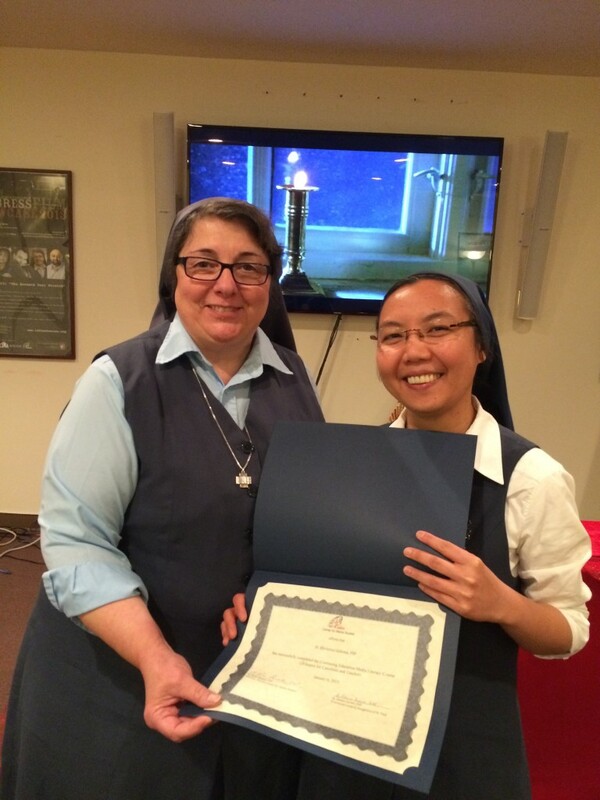 Sister Neville Christine (stationed in Redwood City, CA; right outside San Francisco) holding her diploma. Sr. Neville believes that in the context of formation, this junior encounter truly broadened the horizons of the production media for the sisters, helping them develop their skills in preparing context and engaging in the media. It was a time of formation, sharing and reflection. She enjoyed praying together during the day with community members and her favorite part was the variety of presenters in different aspects of media and hearing different perspectives of how to analyze media. 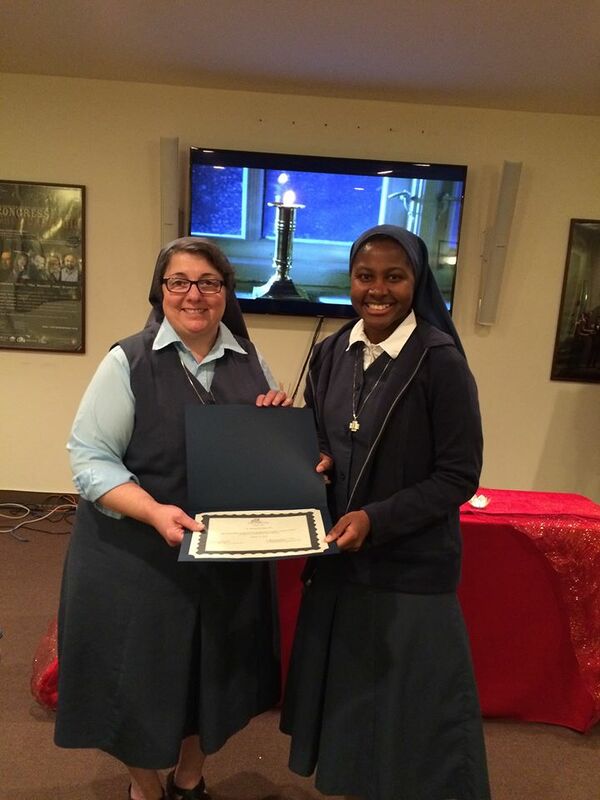 Sister Theresa Aletheia Noble (stationed in Miami, FL) holding her diploma. This junior encounter centered in media literacy was a good refresher for Sr. Theresa Noble. She enjoyed learning more about the subject and especially Sr. Nancy Usselmann’s talk about her studies in theology and how to look at films through sacramental lens. One of her favorite things was the looks on people’s faces to see a group of happy sisters walking around Hollywood. She recalls one man coming up to her and saying he was very happy to see them. 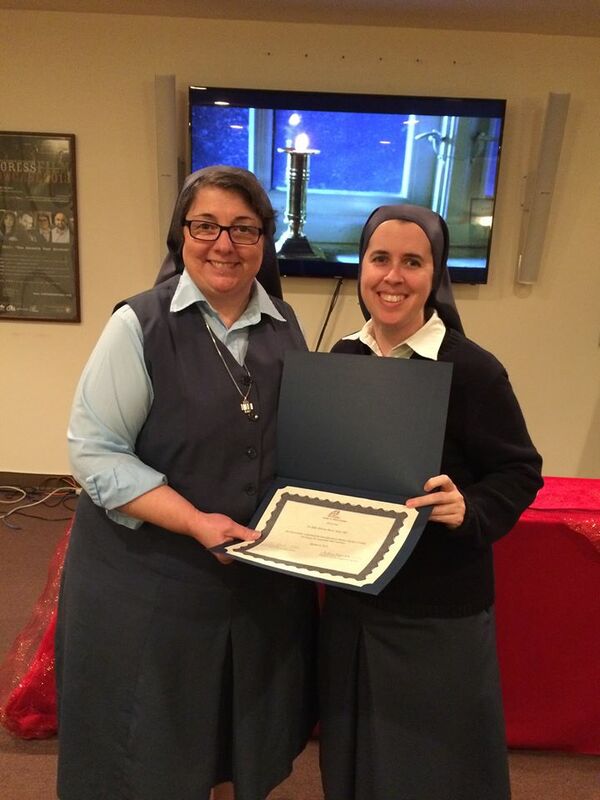 Sister Khristina Galema (stationed in Culver City, CA) holding her diploma. Sr. Khristina just made her profession in August so this was her first Junior Encounter. While she didn’t know what to expect, she was excited to see what it would be like. Sr. Kristina described the experience as a beautiful time of sharing about their lives in their respective communities since they don’t all live together. She went on to share that she could feel the spirit of St. Paul and his zeal for souls alive among her fellow Juniors. 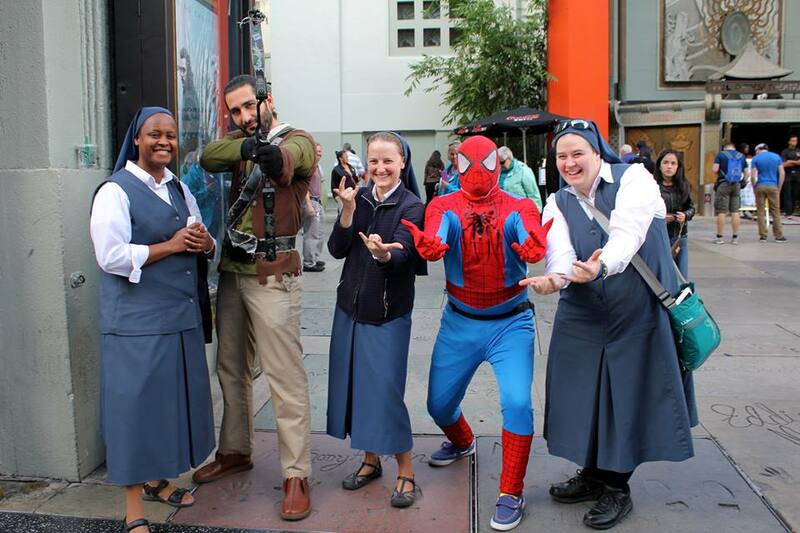 Sr. Jackie, Sr. Theresa and Sr. Laura having fun in the streets of Hollywood with Spiderman and Robin Hood. The Junior Encounter was not all just classes and prayers; the sisters also had time to have some fun! They had some free time to explore Hollywood and do some sightseeing. 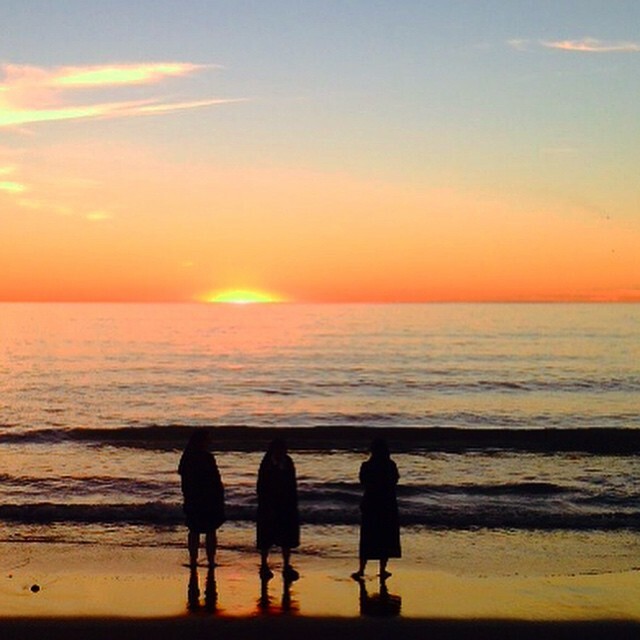 The sisters also had the opportunity to enjoy a beautiful sunset as pictured below. Sisters enjoying a beautiful sunset in California. MY favorite part of this report was reading YOUR favorite parts. Your personalities shine through. Thanks much and God bless you!